To be strategic, one needs to know where to look. To know where to look, you need to know how to look, or rather, how to think, because your thinking creates your world. The better one understands your world, the greater your chances of surviving and prospering. But the world is difficult to understand. It is highly integrated, interactive, dynamic and complex and cannot be approached by viewing issues in isolation. Unfortunately, most educational systems, and to a large extent industry as well, tend to be preoccupied with a somewhat reductionistic and fragmented, analytical way of thinking. Analysis implies breaking up wholes into their constituent parts, therefore the analytical approach focuses on detail, the verification of hypotheses, and rule-based, convergent thinking. Fixed concepts, irreversible time and linear causality are the primary forms of explanation. Analytical methodology reduces a system to its elementary components to study the detailed interrelationships between them. A strong analytical approach to problem solving is often associated with a technical-specialist work orientation in structured contexts – where it actually is quite effective. The development of integrative and creative thinking tends to be neglected by the educational system during our formative years. Learners are seldom required to apply their mathematical formulae in the science class or their physics and chemistry knowledge in the domestic science and art courses. The application of acquired knowledge within everyday life contexts also seems to be overlooked. The purposeful integration and application of knowledge in real life, as well as an appreciation of the dynamic and coherent functioning of systems are, however, required to deal with real issues in the real world. Integrative skills, which can also be referred to as systems thinking, thus need to be developed. It involves a focus on wholes, the interactions among elements making up a system and the complexities of such interactions. In other words, whereas analytical thinking involves understanding a system in terms of its constituent parts, systems thinking reverses the relationship between the parts and the whole. That is, the properties of the parts can only be understood in terms of the dynamics of the whole. 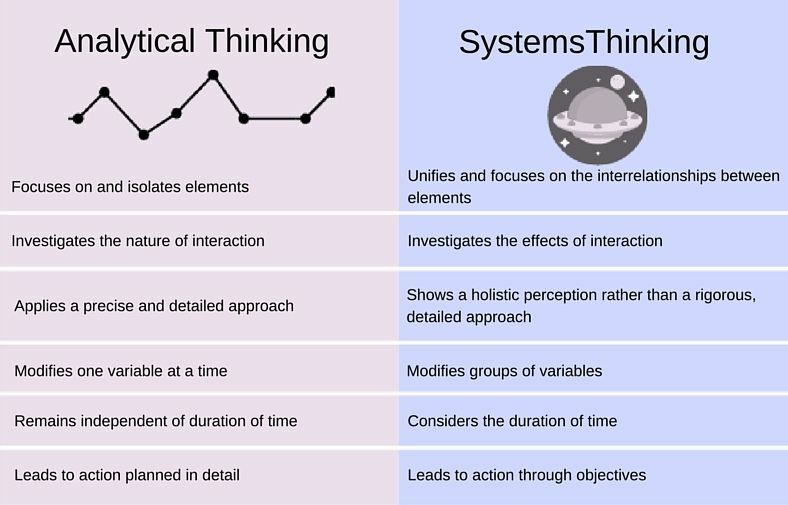 Systems thinking thus provides a viable and complementary alternative to the analytical approach in that it creates an awareness of the inadequacy of simplistic cause and effect explanations. Systems thinking acknowledges the interrelated nature of components, accommodates for feedback, pattern and interaction, and considers meaningful wholes. That is, it is a unifying and integrative approach. Concepts generally associated with the systems paradigm are integration, collaboration, teamwork, partnerships, stakeholders, holism, synthesis, seamlessness, network, feedback, flexibility, interdependence and growth. Systems thinking represents the basic thinking skills that can be applied strategically in the work environment. How to develop systems and strategic thinking? Cognadev offers a systems and strategic thinking course aimed at HR practitioners, students and employees. It involves the application of systems thinking within the strategic business context, which entails the integration and contextualisation of dynamic, vague and complex information which cannot always be dealt with analytically. Systems thinking principles are thus applied to organization-specific challenges to formulate business strategy. The course deals with real strategic challenges and focuses on the identification of root causes, dynamics, creative options and the contextualisation and measurement of business decisions. Intended to improve big picture thinking and decision-making in complex and ambiguous environments, it provides the opportunity to practice intuitive and integrative skills. Work-related information is used to facilitate skills transfer to the work context and to enhance the effectiveness of judgement in vague and dynamic environments. The three-day Systems and Strategic Thinking Course takes place in Johannesburg on the 13-15 April 2016. Contact Cognadev to book your place.